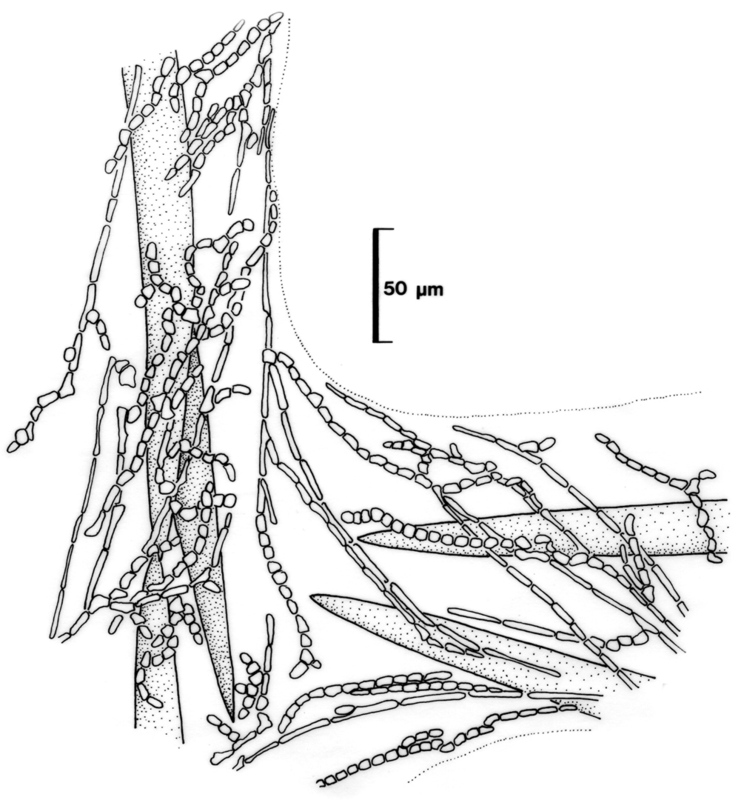 Plants filamentous, irregularly branched; with the exception of monosporangia completely endozoic. Filament diameter 2-7 µm, the cells 1-10 times as long as broad, in general long and narrow cells in main filaments, short and broader cells in lateral branches. Monosporangia exserted, ca. 9 x 7 µm. Recorded from Hout Bay (west coast) to Bird Island (16-38), in subtidal sponges. World distribution: also recorded from Indonesia and South Australia (W. Guiry in Guiry & Guiry 2017).. Type locality: Aru Islands, Indonesia (Woelkerling & Womersley 1994). Notes: see discussions (as Audouinella spongicola) in Stegenga (1985) and Stegenga et al. (1997) for further illustrations and details of relationships with other species. Colaconema spongicola, in sponge. Host surface shown by dotted line. (Reproduced from Stegenga et al. 1997; as Audouinella spongicola). Guiry, Wendy in Guiry, M.D. & Guiry, G.M. 2017. AlgaeBase. World-wide electronic publication, National University of Ireland, Galway. http://www.algaebase.org; searched on 23 May 2017. Woelkerling, W.J. (1971). Morphology and taxonomy of the Audouinella complex (Rhodophyta) in southern Australia. Australian Journal of Botany (Suppl. 1): 1-91, 27 figs, 2 tables. Woelkerling, W.J. & Womersley, H.B.S. (1994). Order Acrochaetiales Feldmann 1953: 12. In: The marine benthic flora of southern Australia. Rhodophyta - Part IIIA. (Womersley, H.B.S. Eds), pp. 42-76.